We're always interested in hearing from customers and partners about new and unique ways they are using the Brightcove APIs and our markup language, BEML, to build highly customized online video experiences. The flexibility of our platform enables organizations of all kinds to deliver customized user experiences that match the overall design and feel of their site and help them to deeply integrate video with the rest of their Web content. One such partner, Viget Labs, recently blogged about an interesting project they have underway with a client who wanted to expand their Brightcove implementation and add some additional customization to the video experience on their website. Viget's client wanted to add more functionality to their Brightcove players and make their video content more visible to increase views and user engagement. To address both concerns, Viget created two players. In the first player, the user can see a selection of "Featured Videos" and "Most Watched Videos," as well as a wider selection of recently added and highest rated content. 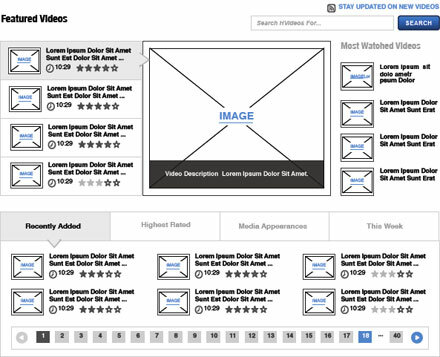 This approach puts the user only a few clicks away from more than 350 videos. The second player is a standalone player to display a single video, but with an expandable view of the four main sections of additional content. Both players were built using the Brightcove APIs and BEML, while the "Most Watched Videos" list is compiled through Brightcove's analytics features. So far, Viget has been happy with the results and the ease and flexibility of building customized video players through Brightcove. We hope to see many more interesting use cases from Viget in the future, as well as the rest of our fast-growing partner ecosystem and customer base.